Hello again friends! 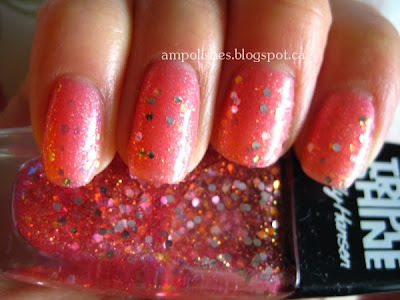 Today on the blog I have two new colours from the Sally Hansen Triple Nail Colour collection. These two colours will be released beginning January 2014 nationwide across Canada. Sally Hansen's Triple Shine Nail Colour "is formulated with an Ultimate Shield Complex, exclusive to Sally Hansen. The innovative one-of-a-kind formula is designed to help polish withstand the wear and tear of everyday living, to deliver high impact colour and maximum shine." This new collection contains 29 different colours categorized into three colour palettes including Iridescence, Pop and Fanta-Sea. The colours we received, Twinkled Pink and Sparkling Water were both from the Fanta-Sea category. 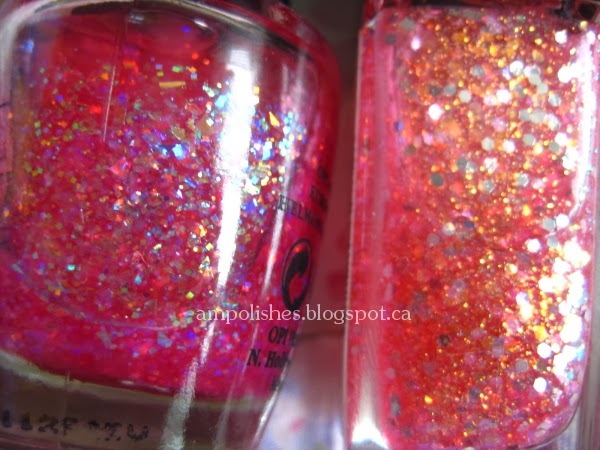 At first glance I thought Twinkled Pink could be a dupe for OPI I Lily Love You, both have a translucent pinkish base with a little bit of a copper sparkle but when I put them side by side they and that's where the similarities stop. 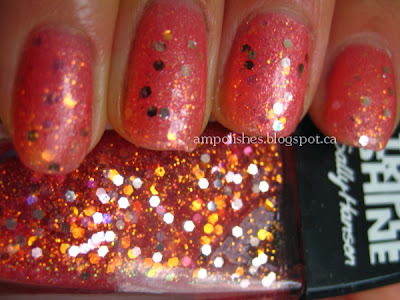 OPI I Lily Love You has a wider variety of sparkle and flakies. 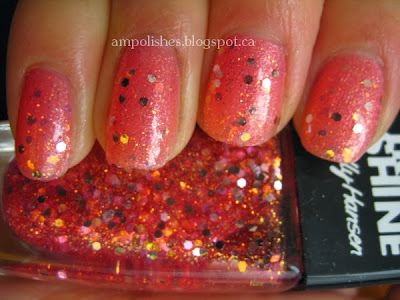 In the swatches below I used Sally Hansen Satin Glam Chic Pink as my base and one thick layer of Twinkled Pink. I cannot begin to tell you guys how much I loovvvvved this colour. The polish dried to a high gloss shine and the true colour was impossible to capture. 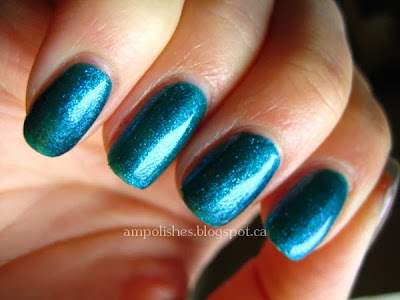 This is a colour you really need to see in person, to me it looks like a dark and sparkly bluish-emerald. I might be biased because I love dark green polishes. Let the swatches speak for themselves! I used two layers to achieve opacity. I'm definitely looking forward to trying out more of the polished from the Triple Shine collection. Amazed at how pretty and glossy they look! 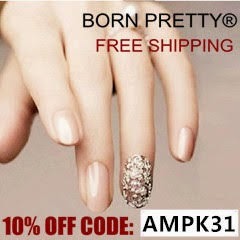 Have any of you tried any of the polishes from this collection? Let me know which ones you've tried and love! 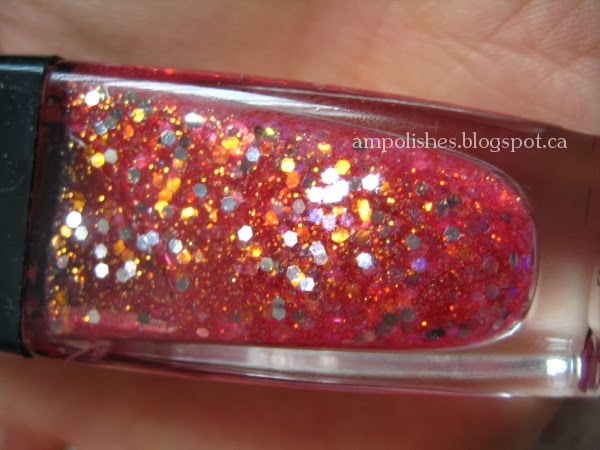 Each polish is 0.33 fl oz / 10 ml in size and priced at $6.95 MSRP. The collection contains 29 new shades and will be available in most drug stores across Canada beginning January 2014. Oh so pretty and they remind me of a lazy day in the Caribbean. I totally need a lazy day in the Caribbean Daphne! Especially with the freezing weather in Toronto right now.